That doesn't mean it's aliens. Too often, when we encounter a seemingly unexplainable occurrence in space, we automatically think Aha! Aliens! It’s not exactly best practice to jump into declaring extraterrestrial life with a snap of a finger. But neither should we be too skeptical. A bit of both, certainly. That’s why, when Laval University astronomers E.F. Borra and E. Trottier submitted a study about stars producing what appears to be ETI signals, we shouldn’t ignore it, nor swallow it entirely. In any case, the strange phenomena comes from their study of data from the Sloan Digital Sky Survey. 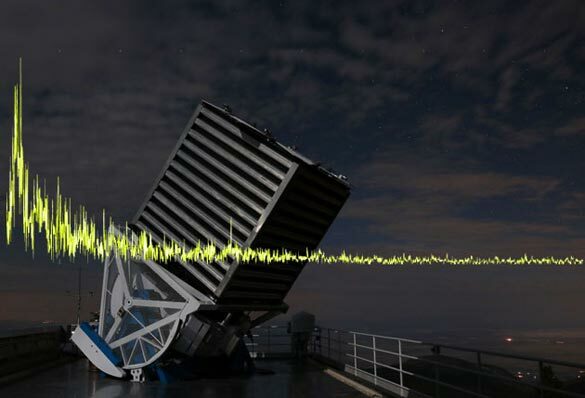 Analyzing the spectra of 2.5 million stars, they came across 234 that produced the same strange signal — pulses of light at constant time intervals. The stars were all “overwhelmingly in the F2 to K1 spectral range,” the authors claimed, very similar to our own Sun. Is it possible that, like our Sun, these stars host a system with intelligent life, and are sending signals to contact other intelligent species? To Borra, it seems very likely, especially since the findings match a 2012 study he’d written about ETI signals. The authors easily dismissed three of the five possible explanations to the phenomena and settled on two: either these are effects of the Sloan instrument itself and data reduction, or they are ETI signals. But are they really? It remains difficult to say, especially since the authors acknowledged that “the signals are due to highly peculiar chemical compositions in a small fraction of galactic halo stars.” And it is very possible to have a subset of stars that behave this way. Not to mention the paper’s still up for peer review. As the saying goes, “Extraordinary claims require extraordinary evidence,” which the Breakthrough Listen Initiative team quotes in a response to Borra’s findings. The Breakthrough team isn’t too eager about the whole study, giving it a 0 to 1 score on the Rio Scale. That says a lot coming from a group dedicated to the search for extraterrestrial intelligent life. In this case, we’ll have to stick to the likeliest possibility: the 234 blinking stars are what they are — blinking stars.